As you’ll be very much aware, project management involves a whole plethora of working roles. Much in the same way PM’s come in all shapes and sizes, the software designed for them is versatile. It can be hard to figure out which one you need. Each system differs from the other, sometimes slightly, sometimes dramatically. The marketing can get overwhelming, leaving agency leaders to slog back to their Excel spreadsheets and wait another year before attempting the search for their project management tools. With creatives, it’s even worse. A lot of the time, it feels like the things that are “made for them” are secretly the same as all the other project management tools but they’ve just put the word creative in front. That doesn’t mean you should give up. An insane amount of money is lost to budgeting for projects in Excel. I’m not talking money is wasted on misused time, although that’s also true. I mean that numbers are entered incorrectly, so budgets are wrong when completed and money is quite literally physically lost. They’re tiny boxes, and even though we’re capable of inhuman feats, project managers are only human. Finding software that protects your bottom line is just as important as ensuring your company is collaborating properly. And no, using Skype for all your company communication is not a good idea. Don’t worry, we’ve been there and we’ve got one for that. On that note, we’ve compiled a list of 7 creative project management tools. Everything mentioned is multi-user and will help run your creative projects. We’re not promising that they’re all made specifically for you, but they are at the least more favourable towards creative agencies. We’ve also categorised them and explained what they do so that you’re not just looking at a list of 7 of the same thing. Here’s an honest review of software we think could work for you. *We’ve supplied a list of software that we think is good for creative agencies, the list is by no means exhaustive and we are not saying that any one software is better than any other, these are just the ones we like. Integrates with lots of sales and accounts packages; Sage, Xero, SAP, Salesforce. Procim is rooted in the budgeting process, making it unique. The project is run from within this web based system, so resources are allocated, timesheets are entered and documentation is automated. Procim comes with a range of useful and unique tracking documents to create a smooth budgeting and reconciliation process. Each line item is entered into the right category and profits etc are automatically calculated by the system. Any losses are highlighted in red making it easy to catch mistakes. With each phase of the project process being recorded and tracked within Procim, the software gives you an instant oversight of your actual costs to date. When someone fills in a timesheet or raises a purchase order or expense, Procim subtracts that amount from the available budgeted item giving project managers a complete understanding of their bottom line at any one moment and making Procim the perfect all round creative project management tool with a twist. Procim was originally created for the live events industry. As its client list started to grow, it spread its specialisation into other creative areas. However, each area happened slowly meaning Procim have honed and specialised their software selectively for each creative industry they work in. Procim comes with everything from industry specific templates to a support team that understand the needs of creatives. Procim requires a minimum of 5 users, so while it’s a very good project budgeting solution for small businesses, it can’t accommodate really small businesses. Integrates with lots of everyday apps; OneDrive, Dropbox, Google Calendar. Asana has these wonderfully designed boards where you post your company to-do’s and project plans. Everyone can comment on projects making it a great environment for collaboration. 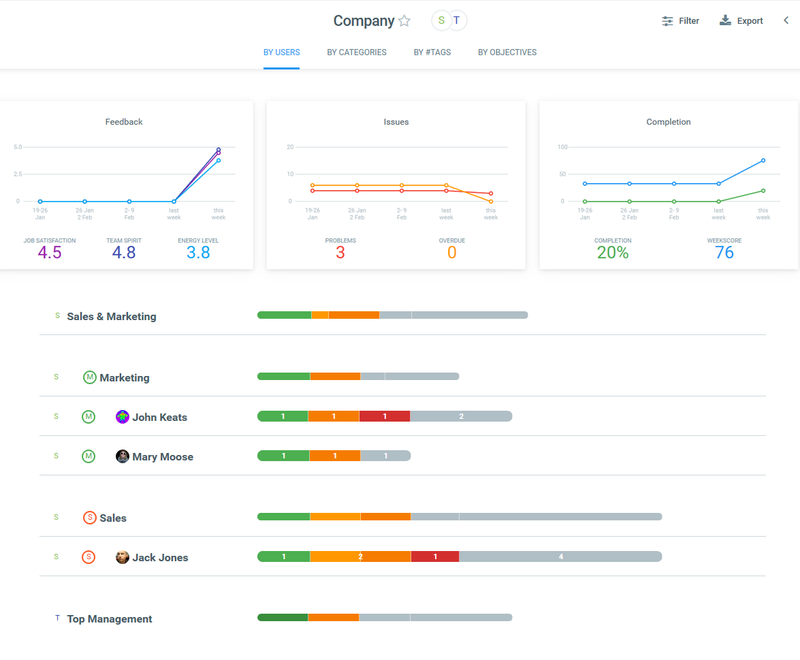 This creative project management tool is a platform from which people can see their assigned tasks and report back without needing to send each other countless emails. People can check their calendars in a visual way that lets them see if project managers have assigned them overlapping tasks. Let’s face it, most creatives are notably unsettled when looking at something hideous. Apparently, no one else seems to care because most of the project management software out there looks like patchwork code wrapped in ugly grey boxes. Asana’s interface isn’t ugly, that’s the main reason it’s up here. It’s pleasant and enjoyable to use, you can drag and drop tasks in a nice satisfying way. One of the industries they’re crafted for is Marketing, making them a good project planning choice for a lot of creative agencies. You have to keep Asana open at all times to see messages, it doesn’t notify you when someone’s commented on/edited a project. You can’t see all your tasks in one place. It needs integration with other software to be a fully functioning project planning platform. 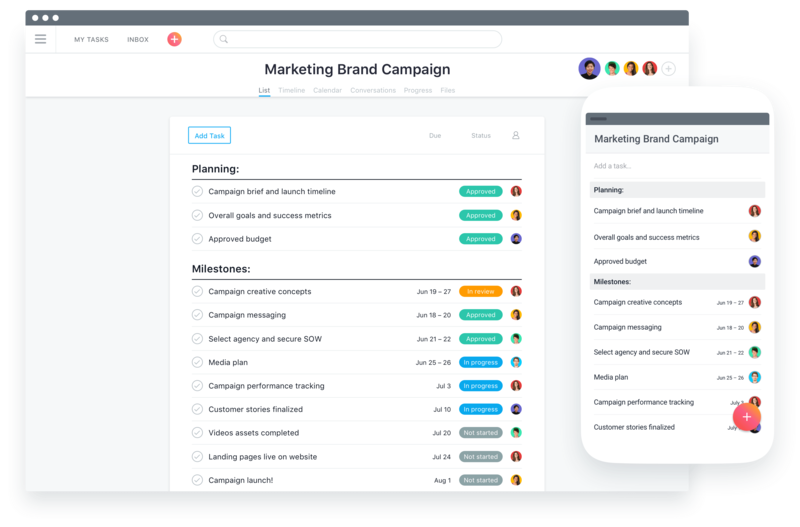 It’s very limited, which isn’t necessarily a downside but you should just be aware that unlike a software like Procim where there are loads of features, Asana is a project board and very little else. 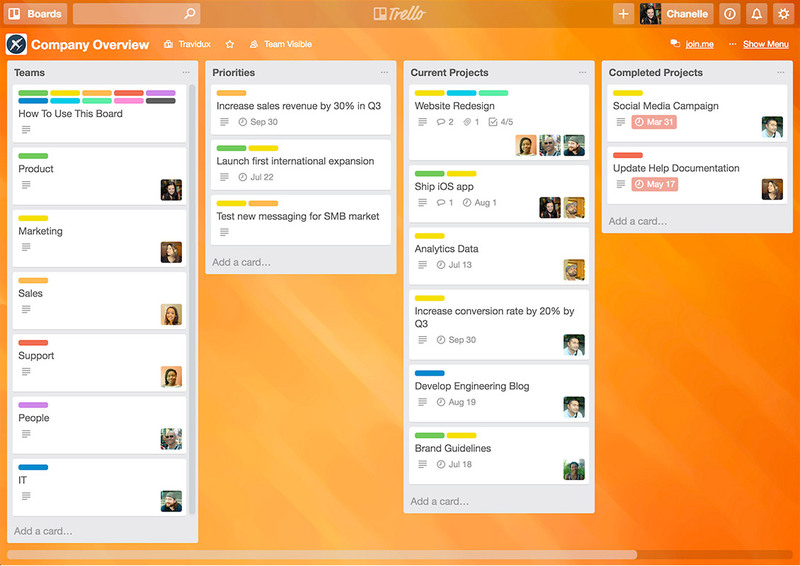 Like Asana, Trello’s a place to co-ordinate your to-do lists and collaborate on ideas. You can create your project’s lifecycle in Trello and then allow everyone else to collaborate on it as the project unfolds. However, Trello allows for pictures to be attached to “cards” on the “boards”. Let’s say you need a project co-ordinator to check out venues, you can post up pictures with the to-do assignment so that everyone understands a little better what you’re after. The images are the project. It’s also free. Trello is specifically made to be visual. The project is looked over in a visual way, making it a great choice for agencies who need a place to share visual ideas. Sort of like a Pinterest for project managers. Again, like Asana, it’s not very feature heavy. You’re limited to task creation and to-do lists. Furthermore, for something so visually based, the actual interface isn’t very nice. Everything’s quite close together and it’s a little bit eh. Still though, it’s free so who cares? Integrates with Harvest, Google Drive and DropBox. Brightpod users create Pods out of their projects. You then complete tasks and milestones that feed into the Pod until the project is finished. Everyone gets their own dashboard, and everyone feels just a little bit cooler when they’re working on a Pod rather than a boring old Project. The more relaxed feel of it gives the bitesize tasks more weight. Brightpod might be a good tool for anyone who liked Trello but is ready for something a lot more feature heavy. Everything feels very organised and manageable in Brightpod. Specifically made for marketing agencies. It specialises in digital marketing and creative teams, so you know you’re getting something that’s right for you rather than something thrown together to expand that company’s user base. Doesn’t integrate with invoicing and billing systems, meaning you can’t automate those processes. Remember what I was saying about Skype? Well here’s your alternative. Emailing and Skyping each other can waste a lot of time. Slack is a nice company messaging system that you can use to communicate directly with one another and as a group. They’ve got a mobile app. It’s just a much easier way to communicate with each other. There are loads of understated features, for example, when you copy and paste an image into the chat box it sends it so pleasantly as a file. Apparently, 73% of Fortune 100 companies are using it. It’s free, so if you’re still using outdated messaging systems, give this one a try. In fact, try it even if you’re not using outdated systems. This one wasn’t made for creatives, but the ease, flow and organisation of it makes it perfect for collaborative teams on the move. Creative project managers can share their ideas and plans without the strain of oppressive clunky systems. Slack’s the best. Nothing else to say. Time tracking is a vital and occasionally underestimated part of creative project management. It deserves its own section. Especially since creative freelancers are famed for people trying to screw them out of their pay. Guys, track your time properly. Every, single, minute. Your time is so valuable and it’s very easy to overspend time on a project. Make sure your clients are paying you properly by having a proper timesheet process in place. Enter Harvest. 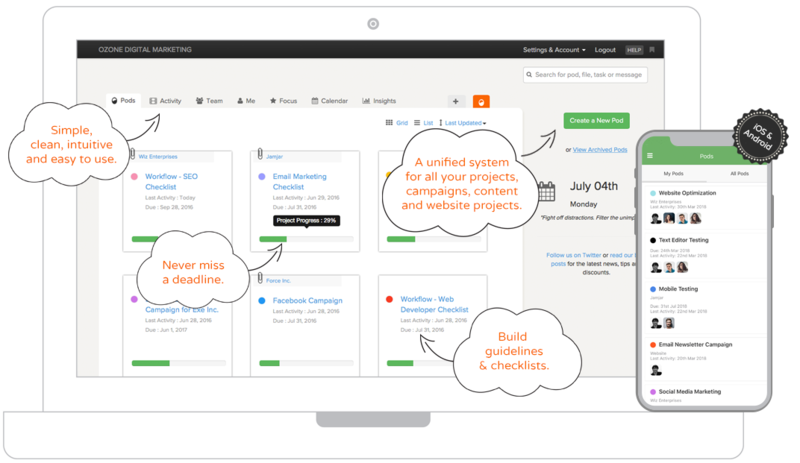 Harvest integrates with so many other creative project management tools, making it a great addition to your PM toolbox. Nice layout in a lovely unoffensive orange. Harvest comes with stopwatches attached to the timesheets. While creatives may lose track of time and find it hard to remember exactly how many hours were spent, Harvest can essentially automate the process for them. Before settling down to design an advert or plan an event, creative project managers can simply press the button and then stop it when they’re finished, logging it under that project and making sure you bill for the correct number of hours. It’s easy to forget to turn the timer off at the end of your project, it takes a lot of practice to start remembering when to use Harvest and even then people forget. Weekdone sets structured goals on a week by week basis. It allows you to provide feedback to your team with 1-2-1 personalised discussions. You can also give feedback and recognition with emojis, praising progress as people complete their goals. It’s kind of like a fitness trainer for events. You can then organise your quarterly objectives using the week plans. Again, lovely interface. Colourful, simple and playful. Weekdone is good for more goal oriented creative agencies. It’s very focused on feedback, goals and smashing targets. It is what it is. It can be difficult to get the hang of and it’s a slightly different way of tracking projects. The company use words they’ve probably made up that feel very sales team, which adds to the goal centric personality of it. It’s a love or hate sort of software. Book a demo to see what Procim can do.